Turmeric is a storehouse of healthy properties and one of the most potent and powerful spices used in cooking and skin care products. Turmeric is also popularly known as Haldi in India. Turmeric is rich in anti-inflammatory and anti-ageing properties. Nutrition wise turmeric contains zinc, magnesium, iron, potassium, vitamin B6, C and E. Turmeric also contains a compound named curcumin which is said to have several health benefits. Let’s see amazing health benefits of Turmeric Milk or Haldi Doodh here. Turmeric is used on cuts and wounds and aids healing. In combination with milk, it forms a potent mixture that has many a health benefits. Turmeric milk is extremely effective in fending off cough and cold, especially when taken when you start showing signs of cold. It contains antibiotic properties and is very effective to fight harmful environmental toxins and micro-organisms. Taking hot turmeric milk provide the body the required warmness to fight cold and cough. Most common health problems that we come across with the change in climate are getting attacked by the viruses of cold and cough. Turmeric milk has warming and anti-inflammatory properties that cures respiratory tract infection. Warm Turmeric milk is beneficial in cold and cough. If you are suffering from nasal congestion, then turmeric milk is best medicine which will give you best result to cure it from its roots. Having milk at night is anyway beneficial for health and it induces good sleep. When teamed with turmeric, it also acts as an anti-ageing tonic. Turmeric milk is used to cure arthritis and treat swelling due to rheumatoid arthritis. It also helps in making the joints and muscles flexible by reducing the pain. Turmeric milk fastens the recovery from an injury. Most people drink haldi doodh after a physical trauma, sickness or surgery to speed up the healing. Turmeric milk gives the best relief from aches and pains, especially back pain. This can also strengthen the spine and the joints in the body. Turmeric milk helps fight free radicals due to its anti-oxidant property. Before you sleep, don’t just reach for that anti-aging cream for your dose of anti-oxidants, but also drink up a glass of turmeric milk to maintain your youthfulness. Turmeric milk is considered an excellent blood purifier and cleanser in Ayurvedic tradition. It can revitalize and boost the blood circulation in the body. It is also a blood thinner that cleanses the lymphatic system and the blood vessels from all impurities. Diabetic patients will greatly benefit from turmeric milk as turmeric improves blood sugar levels, but skip the sugar in the recipe. When you consume it regularly, it may lower blood sugar levels significantly. Turmeric is a natural skin’s food. 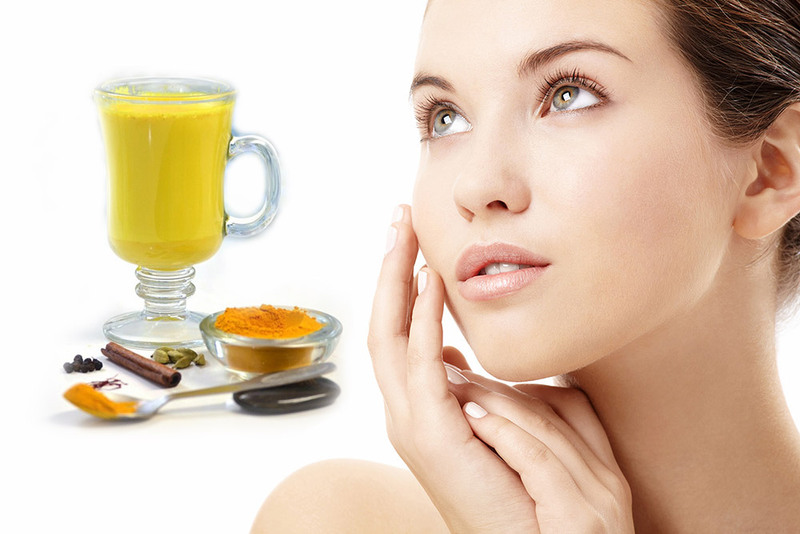 Having turmeric milk regularly can purify and nourish the blood and results in healthy and glowing skin. Due to its anti-bacterial and antiseptic properties it is excellent for skin diseases like eczema, acne, skin cancers etc. and helps in preventing premature aging. The antioxidant properties of turmeric milk fight the free radicals that are known to damage our skin, leading to loss of sheen and elasticity. Turmeric exhibits strong antioxidant activity comparable to vitamin C, E and Beta-carotene.